This Barbie Birthday Cake was made for my two little daughters who celebrated their birthdays in Januarry 2011. Beautiful! I especially love how you placed it on a round cake. Adds depth and more servings too!! What an INCREDIBLE cake! Fantastic. Your daughters are just SO lucky. Oh whoa! How did you keep her upright? And how long did it take to make? You had me (and my daughter) at "Barbie!" I LOVED Barbie growing up and my little one is starting to now. I showed her the picture of this cake and she was fascinated that the dress was a cake. Beautiful! Your daughters are lucky gals! Hello my friends, thank you for your nice commends. Well, I used a carton tube to create space for the doll and the dress decoration took me about 45' minutes. You did a great job on it- I remember my mom made me my very own Barbie cake when I was little, too- so much fun! My mom made me one of these when I was little, I loved it to pieces!! Lovely dress! You did an amazing job. I have something similar coming up these days! My mom made on of these for me when I was a little girl! Great job! Wish I had a little girl to make stuff like this for - boys just don't like the same stuff! These cakes were really popular in Australia when I was growing up (not that I ever got one...hmmmm, maybe I'll make one for my 40th next year.) We use a Dolly Varden tin to create the domed cake for the skirt. It's also perfect for beehive cakes. Thanks for the trip down memomy lane. This is so pretty! Too pretty to be eaten in fact! Love it. A little girl's dream cake. Very lovely cake. I like the extra tier at the bottom because you can never have enough cake! 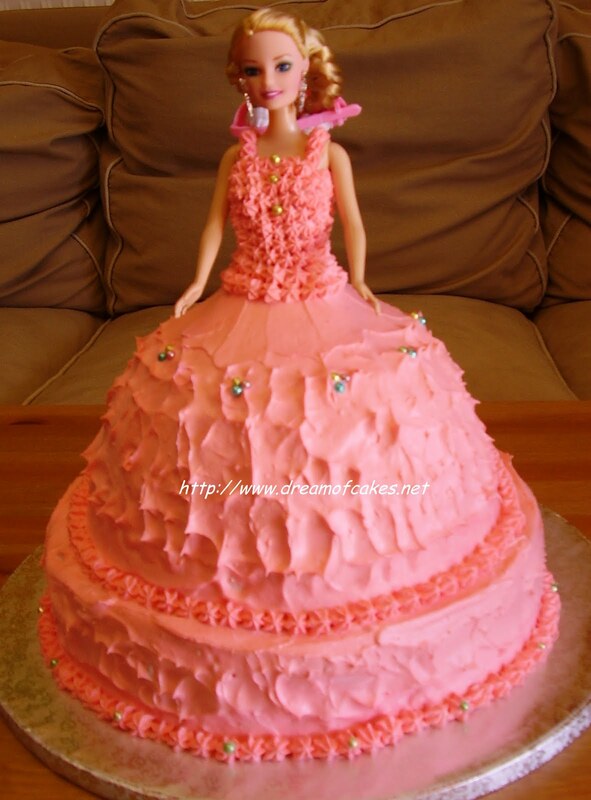 I like pink and I like Barbie cake!